Created from the two neighbouring resort towns of Crans and Montana, the beautiful and uniquely-placed Crans-Montana is known just as much for its beautiful sun-drenched landscapes as it is for its excellent skiing and accommodation. One of Switzerland’s top snow sports locations, this resort area is suitable for anyone looking to take on some new pistes, enjoy Swiss culture and appreciate the beauty of Valais. 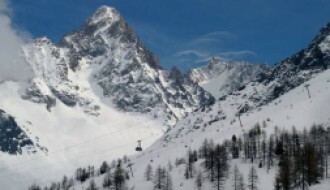 A combination of slopes and plateaus, there’s much more to enjoy than at the average smaller resort. With a family-friendly feel and plenty of space to make the most of the pristine snow, it’s no wonder that visitors to this Swiss resort come back year after year to enjoy all Crans-Montana has to offer. A modest population of just under 900 makes the Crans-Montana area more substantial than some of the smaller village and town resorts out there, but not so large it feels impersonal. Visiting the resort gives you the swift impression of a location that’s designed to make the most out of its desirable location, with all the amenities you could need available close by. 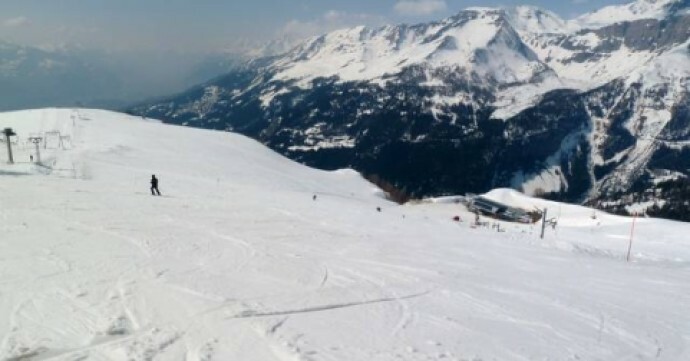 A largely tourist-focused resort, Crans-Montana receives a larger influx of visitors around the school holidays and the snow season, with a steady stream of travellers still making their way to the peaks far above the Rhone Valley whatever the time of year. The resort features over 140km of pistes to enjoy, with excellent ski-lit facilities to make enjoying them a breeze. Outside of the winter season, the resort is also a highly popular destination for fans of golf and tennis, making use of the vast plateau that the area sits upon. The 18-hole Severiano Ballesteros Golf Course is among the most popular in the region. 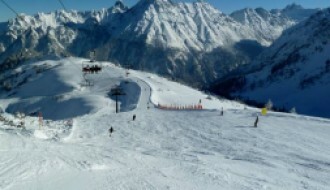 The winter season in Crans-Montana runs from the reasonably standard December to March, with some leeway depending on individual weather reports. With a typical snow level of 100cm, there’s more than enough to go around. Slopes are available for beginners and intermediate skiers throughout the resort, with a handful of more advanced pistes on offer for the experts or those looking for a challenge. For up-to-date snow and weather reports, take a look at our Crans-Montana resort guide here. Thanks to its moderate size and popularity for family-friendly activities, visitors to Crans-Montana are rarely without something to do. Whether it’s hitting the slopes, enjoying the alpine shopping experience available within the resorts or even visiting the nearby town of Sierre, there’s plenty to do and see. As previously mentioned, Crans-Montana is well-known for its history with golfing, but many other outdoor pursuits are available for the more adventurous holidaymakers. Hiking tours, long walks and even mountain biking and rock climbing are available in the warmer months, while the snow season brings more seasonal outdoor activities such as tobogganing. Nearby mountain lakes are also available for those who enjoy swimming in one of the most sunshine-rich locations in the world. The in-resort Fun Park is also ideal for families with younger children, featuring plenty of activities to keep young minds busy and bodies active. In 2017, considerable investments to the Crans-Montana area were announced and are now underway, including the revitalisation and replacement of ski lifts as well as the introduction of new five-star hotels and even a brand new alpine club, for those who enjoy more of a party scene. As an already popular resort that only continues to grow, for those looking into the possibility of buying a property in the Crans-Montana area, there are a wide variety of choices available. From new, modern builds to more traditional or family-focused chalets, you can live in Crans-Montana at just about any pace you choose. 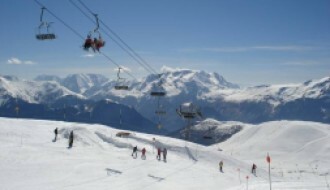 Thanks to this popularity, and the increasing modernisation of the area, compared to smaller resorts the cost of buying in Crans-Montana may be higher; but there’s also a far higher potential for an increase in value from purchase, especially considering the site is one of both natural beauty and modern amenities, ideal for just about any holidaymaker. Travel to Crans-Montana is relatively simple, in part thanks to its popularity and the large proportion of tourism in comparison to its population. For many, travelling by train to the town of Sierre may be the best option, following which a shuttle or taxi is available to take you to the resort itself. For those who prefer to take their own form of transport, driving from Geneva airport may be the best choice, followed by renting a hire car. Geneva is 181km, just over two hours, away from the resort of Crans-Montana. A stunning Swiss mountain resort, Crans-Montana isn’t an opportunity to pass up. With endless pistes, many off-season activities to enjoy and the promise of even more upgrades and renovations, this resort has it all. Combining modern amenities with an area of natural beauty, there’s much to love about this unique region.